Bus rapid transit (BRT) stations should be easily accessible and safe for pedestrians. Photo by Meena Kadri/Flickr. It is increasingly recognized that cities are both powerhouses of economic growth and the primary drivers of economic prosperity, worldwide. This holds true for urban India as well, where exponential growth is expected not only in existing metropolitan areas, but also in the innovative form of 100 new smart cities. This rapid growth presents a huge opportunity to create more sustainable, livable Indian cities, but continuing business as usual patterns will only exacerbate the present challenges of intense traffic congestion, poor air quality, and inequitable access to urban transport. To take advantage of the opportunities presented by urbanization, Indian cities can adopt a more sustainable path by prioritizing people-oriented, integrated transport development. Fortunately, India has recognized the need for sustainable mobility and has invested US$15 billion in the planning and construction of 19 bus rapid transit (BRT) systems and ten metro rail systems nationwide. While these plans and investments are steps in the right direction, many high-end mass transit projects are being planned in areas that are poorly designed for pedestrians and cyclists, resulting in a lack of safety, security, comfort, and convenience. Projects are often planned and implemented in isolation, without proper thought given to how citizens can access transit hubs. Finally, despite their potential role in public life, the areas around transit stations are not yet perceived as integrated places of multi-modal connectivity, where large volumes of people can live, work, and interact with one another on a daily basis. Non-motorized transport modes like bicycling and walking are common in Indian cities, accounting for between 25 and 55 percent of all trips. However, the focus in planning and development circles remains improving and increasing road space for vehicles. Additionally, projects to improve access to transit stations across the country are often piecemeal and vary in their approach and area of intervention. New transit systems are not always supported by robust feeder systems that connect commuters to their final destinations, even though Indian cities feature a host of mobility options provided by cycle-rickshaws, auto-rickshaws, taxis, and private bus operators. These services should be integrated into mass transit planning to provide last-mile connectivity and greater accessibility for residents. 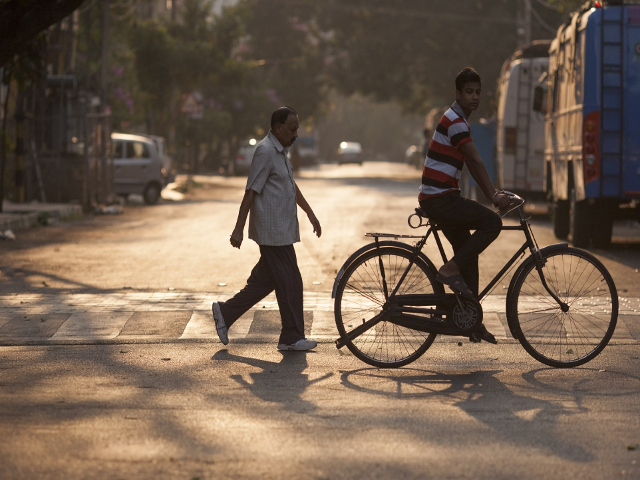 Although cycling accounts for half of all trips in some Indian cities, cyclist safety is not always a priority among urban planners and designers. Photo by Benoit Colin/EMBARQ. 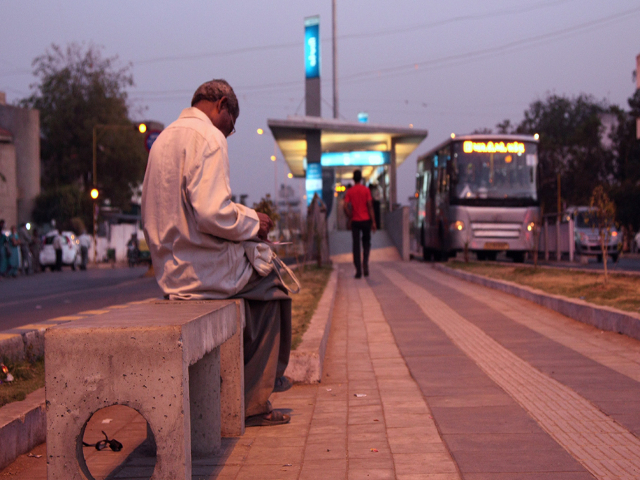 While numerous international examples of accessible transit stations exist, Indian cities face unique planning challenges and require appropriately localized solutions. Some of these include high density urban communities, the prevalence of non-motorized transport, informal employment, lower levels of enforcement with limited public participation, and uncoordinated institutional structures. Until today, there has been no clear guidance for Indian city leaders on designing safe, accessible transit stations. To help planners and city leaders overcome these challenges, EMBARQ, part of the Sustainable Cities program of the World Resources Institute in India, has developed the Safe Access Manual: Safe Access to Mass Transit Stations in Indian Cities. The manual presents a sustainable, people-oriented approach to station accessibility. The new manual lays out clear guidelines for developing accessible stations that prioritize pedestrians and cyclists, integrate multiple modes of transport, enhance the local economy, and serve as vibrant public spaces. It further emphasizes equitable access – particularly women’s safety – as well as safety for non-motorized transport users, in general. Finally, the manual suggests tying together the planning, implementation, maintenance, and evaluation of station areas in a single participatory process to allow local and state authorities to better co-ordinate with one another and ensure that safe, accessible mass transit becomes a reality. This graphic details the safe access approach to station accessibility planning. Graphic by EMBARQ India. As Indian cities continue to grow at a rapid pace, mass transit stations need to be developed in ways that meaningfully engage with local residents, businesses, city agencies, and other stakeholders in planning and decision-making processes. It’s important to have a clear understanding of the distinct service needs of an area, so that local communities can develop a sense of ownership and responsibility for their surroundings, including their transit station. When city planners properly address issues of equitable access, mass transit stations become safe, dynamic places for all to enjoy. 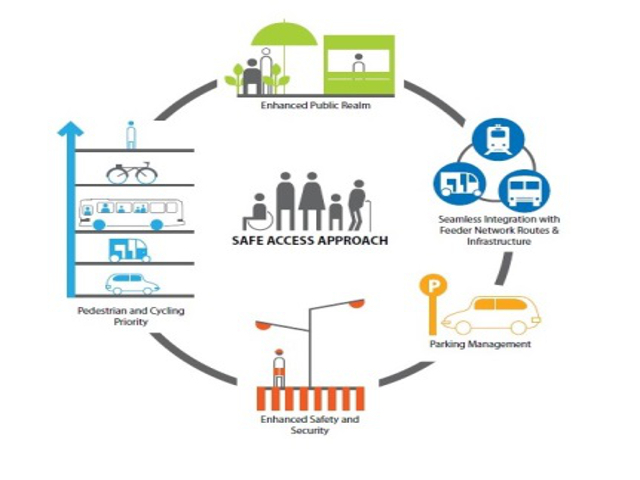 Learn more about the role of urban design in creating safe, accessible transport systems in the Safe Access Manual here.